Today being Mardi Gras it seemed appropriate to celebrate with a traditional New Orleans cocktail, the Sazerac. 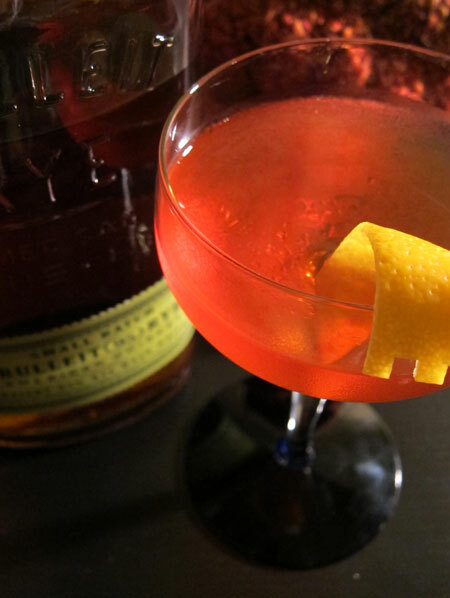 I took the opportunity to see how the new Bulleit Rye Whiskey worked in this classic libation. Stir the rye whiskey, bitters and simple syrup for a good 60 revolutions. Take a chilled cocktail glass and rinse the glass with about 1/4 oz absinthe (or Herbsaint). Discard the absinthe then strain the cocktail into the glass. Express the oils of a lemon peel over the cocktail. Simple as it may be the Sazerac can be a tricky cocktail to make correctly. Technique is often debated with the most contentious aspect being what to do with the lemon peel. Some say it’s sacrilegious to drop the peel into the drink while others think it’s completely acceptable. Personally I drop it in for a nice garnish. How did the Bulleit Rye fair? Quite well, it was indeed one fine Sazerac. I was surprised how much the Bulleit Rye’s unique qualities of spice and sweetness showed through into the cocktail. I haven’t seen the Bulleit Rye in my market yet; their bourbon is a standard in our house, and so is the rye Manhattan, so I’m looking forward to trying their new product. So far my experience with the Bulleit Rye has been extremely positive. Thanks for visiting Doug, I like your site, I added it to my blogroll.